1. Bertie Wooster – of Jeeves and Wooster, his dandy spin on the aristocratic uniform of that period made for a wardrobe rich with inspiration. He also had a sense of humor about dressing up, putting on the most ridiculous yellow golf getup for golfing on a weekend, and a cream dinner jacket for dining at home. 2. Marcelo Burlon – the Argentinian known for his parties and his work in Rodeo magazine, I love his distinct mix of Patagonian folk and tough Givenchy off-the-runway tailoring. 3. Brandon Acton-Bond – up-and-coming shoe designer I met in New York, I admire his sensate approach to clothing: everything is about how the fabric feels, the way it drapes, the way layers peek through holes and diaphanousness, how an article of clothing makes him feel. His no-rules philosophy in dressing is very refreshing. I have to pick one? That's hard because I'm lucky enough to know a lot of stylish men. I tend to like it men who wear high quality clothing. Custom suits, Italian or English shoes. The kind of man who knows who Turnbull & Asser is. My uncle is one of those men, who really puts a lot of care and attention to his wardrobe, even his casual wear will hint at quality. However, not everyone can spend $1200 on a pair of shoes. I do admire the the classic nature of traditional suits and ties, they're pieces you can really invest in, nothing looks better than a man in a well-tailored suit and beautiful shoes. My husband Rocky, of course, has wonderful style, though because the last year he's been focusing on finishing college and our three moves, the last move, we've spent all our money on furniture, leaves little for the clothing budget. Rocky has a great knack for picking out pieces that last for years. He mixes boutique brands like Filippa K, A.P.C, and Acne with vintage, which really withstand the shift in trends while still looking very current. Of course everything he wears has to be bike friendly, because he's always biking around San Francisco. I don't think I have one specific most stylish man I have encountered, but I am fascinated by men (and women), who use clothing as function related to their line of work. One such person is my 'tailoring grandfather' as he calls himself. 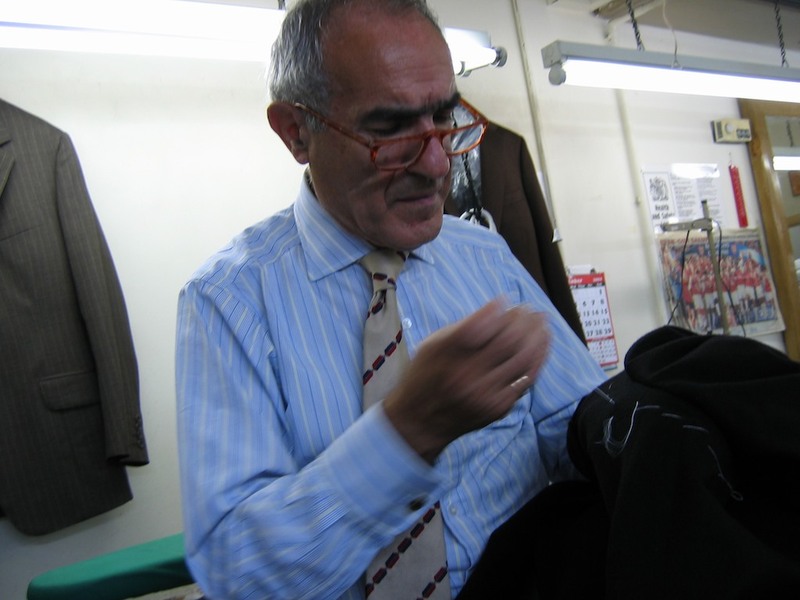 His name is Domenico and he is a Sicilian tailor I worked with for some time on Savile Row. 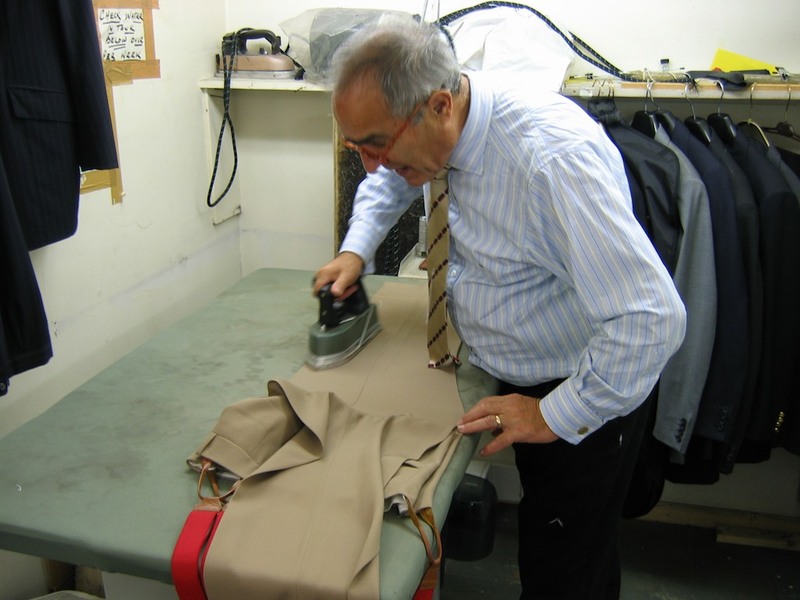 He is now retired but I always admired how he was so utterly involved in his profession and how his manner of dress reflected that, in and out of the workroom. I have attached some pictures for you. 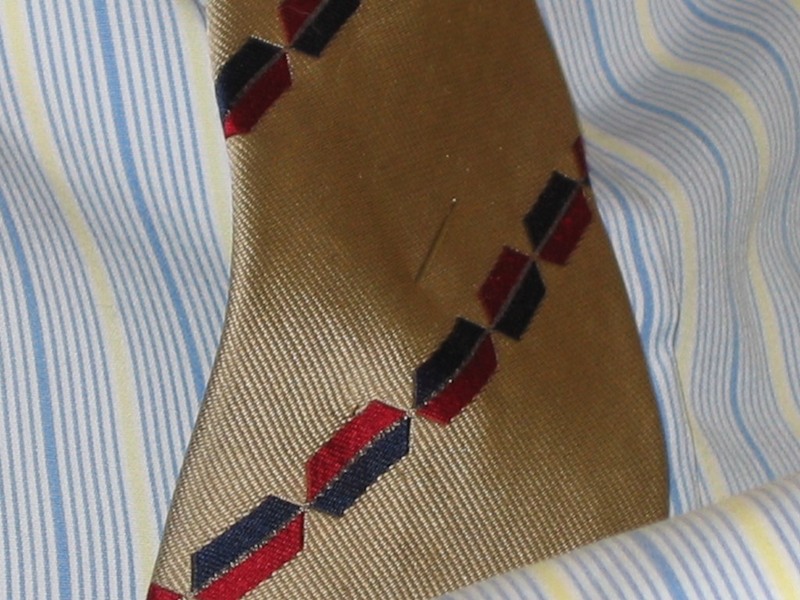 Tie used as needle rest. In the interest of discussion, I would love to know if any of your readers or indeed any of your other collaborators have images or stories of people who individualise their functional work attire with their distinct personality. I think some of the most interesting dress comes from people who use clothing as function, butchers, painters, builders, gardeners, fishermen the list goes on and on .....! Does uniform hinder personal style and creativity or does it in fact focus it by giving one boundaries to play with? Paula has undoubtedly stoked the fire of this discussion. We have talked about the idea of a personal uniform previously on the blog and it is a topic that always interests us. Clothing as function is one of the most exciting facets of menswear. The demands of function constantly push menswear forward be it in terms of cut, fabric development or merely as inspiration for something a little more wearable. Alas both of us lack a profession or lifestyle that demands functional clothing but do you guys fall in to this character? If so, we'd love to hear from you. this is so great! i really like seeing what kind of guys other people think dress well. dom looks like quite character! oh that previous comment was from me jennine. sorry! Jennine: Me too. Looking forward to this discussion getting going. We have lots more responses to post but it would be great to hear what some of the readers think as well.